Today I served at the funeral Mass of my former pastor, Fr. Charlie Chesebrough. 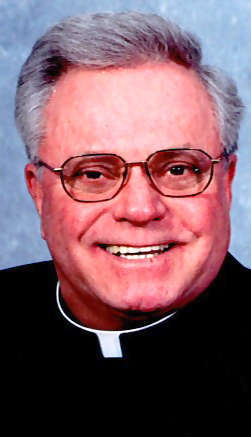 He was my priest for 13 years–ever since I was in second grade. I’m blessed to have known Fr. Charlie, and more grateful to have had him as a friend, pastor, and priest. He told me he was in my shoes years ago, and that he oftentimes felt he couldn’t do it either. He told me of a photograph he used to have hanging on his wall that was of a field of beautiful flowers. In the middle was a big, quite distinct dandelion. He asked me: “What do you think people saw first?” I responded, “The dandelion.” He told me that was a wonderful definition of his priesthood. He spoke of other priests who were better speakers, better advisers, better everythings. But the picture, he said, was incomplete without the dandelion. God’s plan, he said, is not realized if we let our imperfections and shortcomings stop us from doing what we think God is calling us to do. Our Lord, he said, doesn’t choose the normal suspects for various vocations. He chooses jerks, idiots, and shmos. But it’s his plan! We just need to say yes. He told me that he had no doubt that our Lord was calling me. That means quite a bit, you know. Who knows why he’d do such a thing, but God’s ways aren’t our ways. As our time ended, I told him I was glad he was still in Bloomington. I told him I was glad he had been my pastor all those years. He wasn’t politically correct; he wasn’t perfect. He was far from it. But like my confirmation saint, he wasn’t holy in ordinary ways, but by George, he was a blessing to the Church and the priesthood. I went to the last Mass he celebrated at St. Charles, last Tuesday. He told everyone how lucky he was to have everyone at St. Charles as his family. He also said that the most important thing he ever did was celebrate the Holy Mass. A perfect last homily. His example will inform my life. This entry was posted in Catholic News, Eucharist, Priesthood, Reflections, Vocations. Bookmark the permalink.